"This individual had some type of vendetta against the Capital newspaper, and they were specifically targeted"
Five people have died and several others are "gravely injured" after a shooting Thursday at the Capital Gazette newspaper building in Annapolis, Maryland, local and federal officials say. Authorities have identified the five victims as Gerald Fischman, Robert Hiaasen, John McNamara, Rebecca Smith and Wendi Winters. Hiaasen, an editor and columnist, is the brother of author Carl Hiaasen. The suspected shooter is 38-year-old Jarrod Ramos, who was charged with five counts of first-degree murder, according to court documents. He will have a bail review Friday at 10:30 a.m. in Annapolis. It wasn't immediately clear if he had an attorney. Authorities said the suspect was armed with smoke grenades and a shotgun. 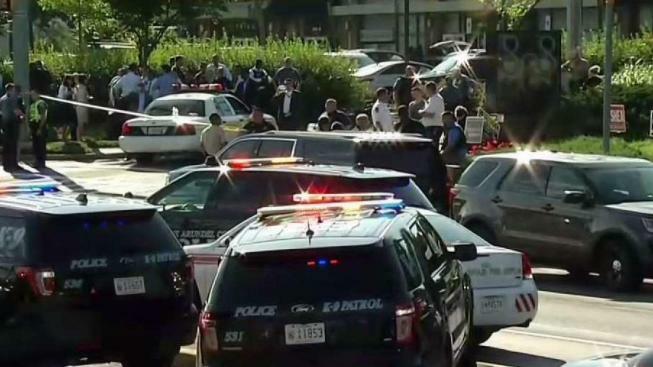 A shooting at the Capital Gazette newspaper in Annapolis, Md., left five people dead and multiple injured Thursday. "This individual had some type of vendetta against the Capital newspaper, and they were specifically targeted," Frashure said. Anne Arundel County Police Chief Timothy Altomare, speaking on Fox News Friday and later in a news conference, dismissed as untrue reports that the suspected shooter had altered or mutilated his fingerprints. On Thursday, two senior law enforcement officials had told NBC News that the gunman obscured his fingerprints. Altomare said Friday that there had been a "lag" on getting finger print results. Authorities were able to identify him using facial recognition software and "a couple other techniques," he said. The nearly 200 people forced to leave the building where the Annapolis shooting happened had to walk to Westfield Annapolis Mall. News4's Shomari Stone spoke to some of them who say they were frightened and traumatized. Ramos sued the Capital for defamation in 2012 after the paper published an article in 2011 about criminal harassment to which Ramos pleaded guilty. Two judges ruled against him. In what a judge called "rather bizarre" behavior, Ramos used Facebook to contact a woman he knew in high school and then sent her threatening emails, called her vulgar names and told her to kill herself, court documents and the Capital's article say. Officials searched the suspect's home Thursday night in Laurel, Maryland, Chopper4 footage showed. 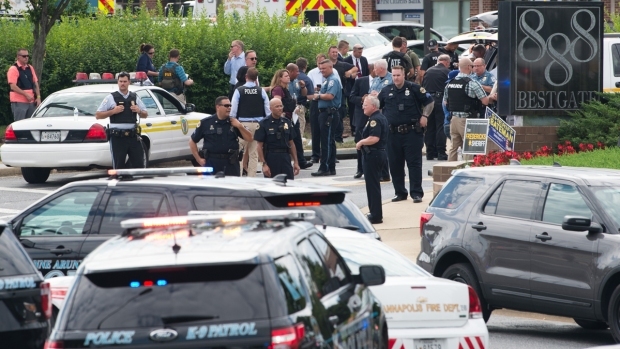 The shooter opened fire inside the Capital Gazette building at 888 Bestgate Road, five miles from the United States Naval Academy. The five-story building also houses medical offices and businesses. Capital reporter Phil Davis said in a string of tweets that he witnessed the shooter fire into the newsroom through a glass door, sending people scrambling for cover under desks. "There is nothing more terrifying than hearing multiple people get shot while you're under your desk and then hear the gunman reload," he added. Davis noted that he sent the messages once he was safe. After the shooting, investigators found something that "may have been an explosive device," said Bill Krampf, the acting police chief for Anne Arundel County Thursday, with Altomare outside of the state. It wasn't immediately clear where the item was found. The shooter used a "long gun," Frashure said. No gunfire was exchanged between the suspect and law enforcement. Officials say they are checking surveillance video to see how the man arrived at the building. A call reporting an active shooter came in at 2:34 p.m, Capt. Russell Davies with the Anne Arundel EMS told NBC News. First responders raced to the scene and arrived within 60 seconds, Gov. Larry Hogan said. Police escorted 170 people to the nearby Westfield Annapolis mall. In a dispatch call obtained by News4, first responders can be heard saying they had located victims. "We've got about four bodies inside," a man says. "We're bringing people out," a man can be heard saying. "We need them corralled somewhere ... These people are coming out with their hands up. I need them covered!" Word of an active shooter caused terror in other parts of the office building. "They were telling us that we were on lockdown, and to get, you know, to get away from the windows, and to just stay clear and stay safe," a woman at a doctor's office in the building said. "I immediately started crying. I started contacting all of my family members." Chopper4 footage showed people evacuating the building with their hands up. Police cars and armored vehicles swarmed the area. County officials praised first responders for the bravery and speed. "They went immediately into that building without a moment's hesitation and demonstrated incredible courage," Anne Arundel County Executive Steve Schuh told reporters. Injured victims are being treated at R. Adams Cowley Shock Trauma in Baltimore and Anne Arundel Medical Center, the county executive said. Several are "gravely injured," the acting police chief said. Officers have secured the building. The governor asked residents to stay away from the area. Defense Highway (MD-450) and Generals Highway (MD-178) were closed, and the area near the mall was closed. 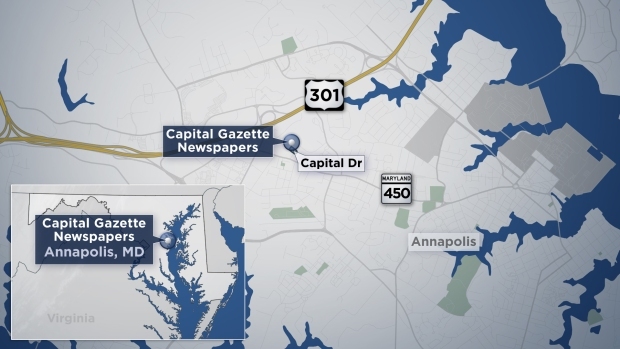 The Capital is a daily newspaper that serves Annapolis, Anne Arundel County and Kent Island, and has robust coverage of the U.S. Naval Academy. The company touts itself as one of the oldest publishers in the country, starting in 1727 with the Maryland Gazette. "This is a typical, American small-town newspaper," Maryland U.S. Sen. Chris Van Hollen told News4. On Twitter, the Naval Academy sent condolences, writing: "The Capital Gazette is our local newspaper and is often the first to tell our story. We are grieving with their staff and loved ones after the tragic events that occurred today." 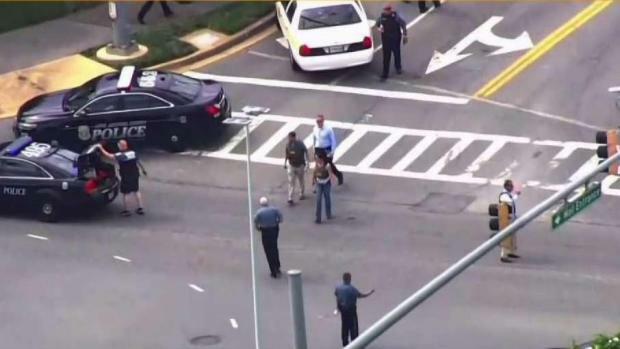 Video from Chopper4 shows people walking out of an office building in Annapolis, Maryland, with their hands up after an active shooter was reported. Owned by The Baltimore Sun, Capital Gazette Communications publications include The Capital Gazette, The Capital, Maryland Gazette, Bowie Blade-News, Crofton-West County Gazette and Capital Style Magazine. Capital Gazette reporters are "our family," Annapolis Mayor Gavin Buckley said. "We know these reporters very well. We speak with them daily. The Capital is one of the oldest papers in our country and they have been part of the fabric of our city for centuries," Buckley said in a statement. "Our first responders deal with these journalists too. This is our family and today’s victims were our friends. Today’s tragedy will not be the new normal for our city, county, state or country." The New York Police Department sent patrols to major news media organizations in response to the shooting in Annapolis. Officers were posted outside the New York Times building in Midtown Manhattan. NYPD Sgt. Brendan Ryan refused to elaborate for security reasons, but said officers have been deployed in and around the city at various media outlets out of an abundance of caution. In D.C., police declined to comment on any increased patrols. President Donald Trump tweeted about the shooting: "Prior to departing Wisconsin, I was briefed on the shooting at Capital Gazette in Annapolis, Maryland. My thoughts and prayers are with the victims and their families. Thank you to all of the First Responders who are currently on the scene." Anyone who needs to reunite with a loved one is asked to meet them at the Lord & Taylor store at the mall. Family members and friends can call 401-768-5522. Capital reporter Chase Cook had this promise Thursday night: "I can tell you this: We are putting out a damn paper tomorrow." Horrified to hear of the shooting at @capgaznews in Annapolis. If you are in the area of Bestgate road please take every precaution until we know more. These are some of the most dedicated journalists in Maryland. My thoughts and prayers are with each of them. The shooting today in the Capital Gazette newsroom in Annapolis, Maryland cannot reasonably be separated from the President's mission to villainize the press as "the enemy of the American people." I'm keeping track of fakes and hoaxes about the shooting at Capital Gazette in Annapolis & will post them in this thread. If you see any, my email is jane.lytvynenko@buzzfeed.com and my DMs are open, send them my way. my high school classmate Pat Furgurson is a Capital Gazette reporter. He told his wife Becky (also a classmate) that he's safe, charging his phone, trying to find colleagues and "putting out a paper, goddamn it"